Having Legal Issues as a Result of Harvey? Auto Accidents to Small Claims Courts. 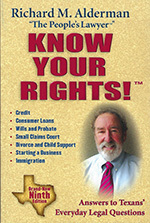 Check out this section to read about legal topics. Books recommended by the People's Lawyer. Useful web sites I've found on the web. A listing of conferences, and resources for lawyers, law professors and others interested in keeping current with developments in consumer law. Click here to see answers to common legal questions.